Okay… this 1991 movie about a mousy young woman,Elizabeth “Lizzie: Cronin (played by Phoebe Cates) who is having relationship toubles (her husband cheats on her and has moved in with his mistress). Her overbearing mother, Polly Cronin (played by Marsha Mason) rushes her back home and completely takes over her life. Once back home, Lizzie releases her long forgotten imaginary friend from Childhood, Dropdead Fred (who had been trapped inside a Jack in the Box (the toy, not the burger place). Dropdead has been locked away since Lizzie was five years old, and therefore acts like a five year old would. Dropdead needs to make Lizzie happy in order for him to be released, but he really doesn’t know how. Dropdead turns out to be a real jerk, as any five year old with powers would be. This is a fun and weird movie, and in many ways left me wondering… for example: is Lizzie a schizophrenic? She definitely shows a lot of the outward signs of being one. This entry was posted on September 25, 2012 by catfishman. 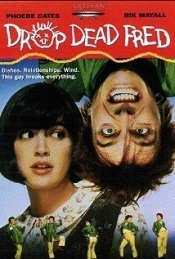 It was filed under Uncategorized and was tagged with cheating, comedy, crazy, dropdead fred, fun, imaginary, Marsha Mason, mental health, movie, Phoebe Cates, schizophrenia, silly.